I grew up in the '60s and jeans are always my go to outfit. For years I have thought about each pair of old jeans as I discarded them. Once I wore through the knees, they would have to be tossed. But then I started blogging and returning to my crafting roots and I truly started to mourn each pair of jeans I had tossed. There is no doubt about it. My hoarder genetic history is regularly at war with my organized self. So I started collecting old jeans again. I saved, mine, my husband's, and my daughters'. The pile grew. And I started a Pinterest board on denim. In fact last year I did an extensive blog series of denim full of wonderful ideas. And I kept collecting. Valentine's Day 2013 was the day that I finally took action and approached those old jeans with scissors and an idea. Although I have been toying around with some other ideas I knew my first project (or maybe projects) would be a pillow for my living room. And today is the big reveal! 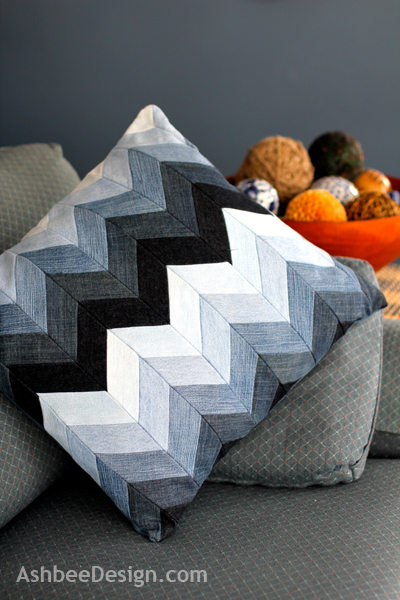 I have a new pillow made by me that combines chevron stripes, ombre color gradation and old jeans all into one! Talk about mixing trends! Photography just doesn't do justice to how rich a fabric these old denim pants became. It is soft yet strong. I just love the new pillow. It really adds a bit of pizzaz to my old sofa! Although the end result looks like it was difficult to piece together, it was really quite easy. 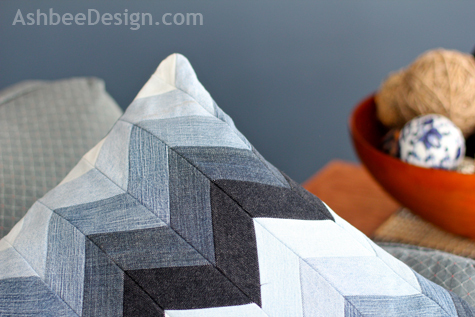 I'll walk you through the steps of crafting your own chevron fabric from scraps so you to can use it for projects. Start with a collection of fabric, mine was old jeans. I have been collecting for awhile so I had quite an assortment! "I did this and it turned out great. Two things I'd add -- the instructions here have an unclear error. 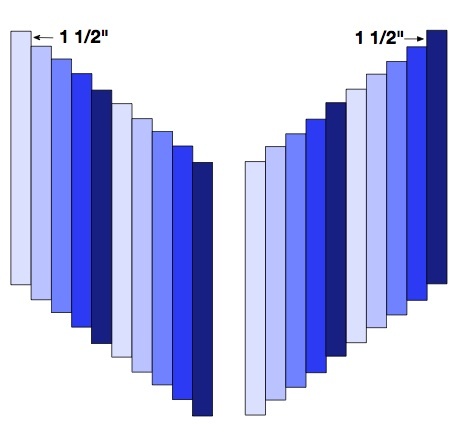 When you cut the strips at 45 degrees, the cut strips should be 3" wide. That's measuring 4" down the vertical side of the piece and cutting at a 45degree angle -- the strips are not 4" wide as noted in the directions. 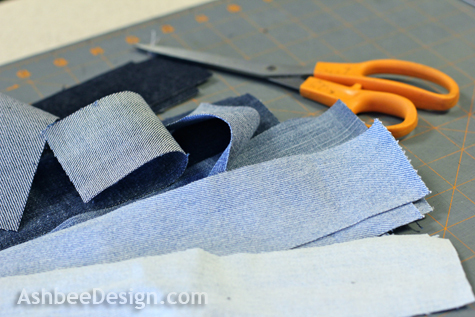 I ended up using some vintage pre-cut denim left over from a rag rug project, so some of my strips were a bit wider than 2.25" and some were smaller and I didn't always have 4 strips of the same color. I matched as close as I could but have two very dark stripes that do match all the way across. Exactly matching the dark stripes draws the eye to them and away from bits that don't match as well. The whole thing still looks great." I knew I want to arrange the stripes in a color gradation so I laid out all of the jeans and picked five pairs that were fairly evenly spaced across the denim blue color spectrum. This pillow which is about 18" square took 5 legs worth of jeans. That means I have the other leg from each of these pairs for another project. It will take more legs if you are lucky enough to be able to wear skinny jeans. I am well past that phase! You also need to chose legs without worn out knees. In fact, the backsides worked best. 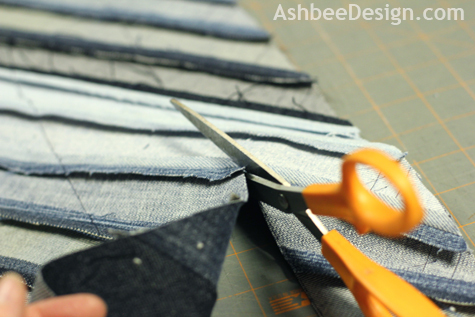 I cut off each leg and cut off all the seams so I was left with a stack a flat denim pieces. On the backside of each I drew parallel lines 2" apart using a Sharpie marker the length of the leg. I cut the strips of fabric carfeully. 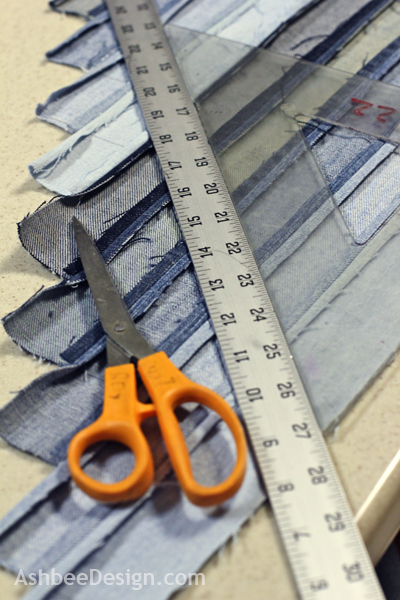 I tried using my rotary cutter but it didn't work well on the denim so I switched to scissors and just cut carefully. This created 4 strips of each color 2" wide by 24" long. 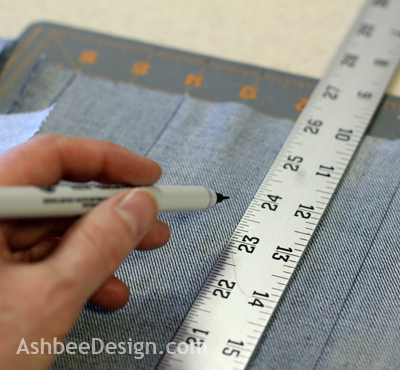 I then measured down 1 1/2" along each piece and started sewing them together in a staggered pattern. I sewed in 1/4" from the edge (1/4" seam allowance). It is important to try and sew the seams straight and even. Each piece is staggered down 1 1/2" from the previous. I started from darkest in color and went to lightest and then repeated the pattern. I sewed half the pieces together with the offset going one way. I sewed the second half together with the offset going the other way. Stream press all seams open with an iron. Using a ruler and a 45º triangle I first marked and then cut the pieced togther stripes into 4" wide strips. It is important that the angle be at 45º. You will notice in my example below that 45º does not line up well with the edge of the piece fabric. That is because I offset my pieces by 2". It should have been 1 1/2" as you were directed above. 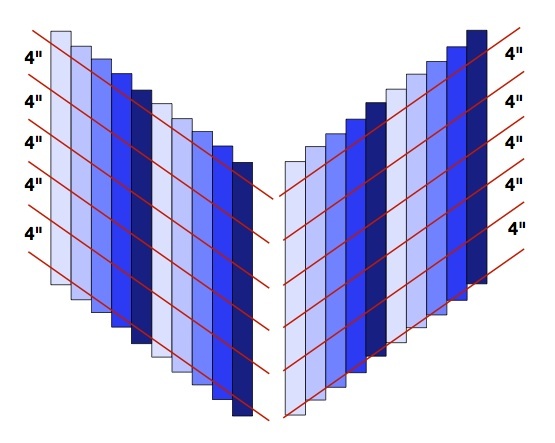 The red lines in the pattern below show the pattern of the cuts to make. Take one strip from the left group above and one strip from the right. 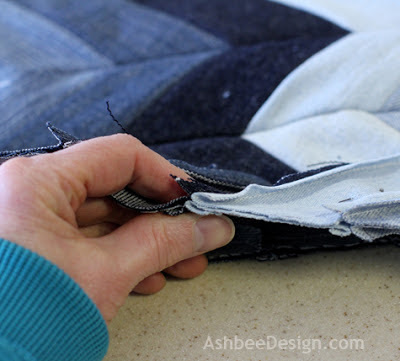 With front sides together, carefully line up the seams and pin in place. Again I used a 1/4" seam allowance working to stay straight and keep the seams lined up. Press open these seams as well. This is the point I got really excited by the prospects of this project. The pieced fabric is stunning! 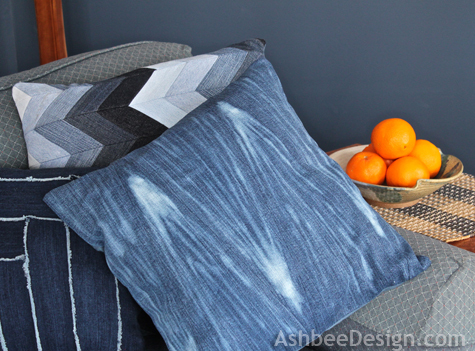 Once I had my chevron fabric with ombre denim stripes made, I took an old pillow and made this fabric into its new cover. I am not going to outline the steps for making the pillow cover. Those are shared in numerous blogs already and there are many ways to do it, all good. 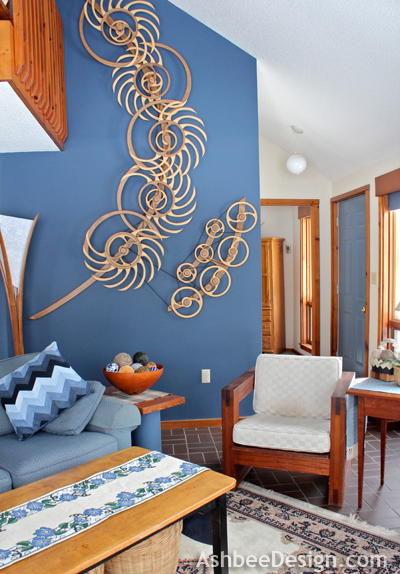 to use a solid color back that matches the window shades and end tables. have the pillow open in that back with a velcro closure so the cover can be removed and washed. The denim is strong and soft. It makes a wonderful pillow cover. And I now have one beautiful pillow on our sofa and two that came with the couch. Looking at the photo I can see that it is just begging for another pillow! Update 2/22/2013: My sofa needs more than one pillow and it needs a variety. I made a second denim pillow using a frayed edges technique. Go here to see more images and the tutorial. Update 3/1/2013: I tried a third technique for pillow # 3- Bleaching. Go here to see how. Update 3/13/13: Machine Appliqué is the technique I used for pillow #4. Probably the easiest so far. Go here to see how. I love denim - the color, the fabric, the possibilities. 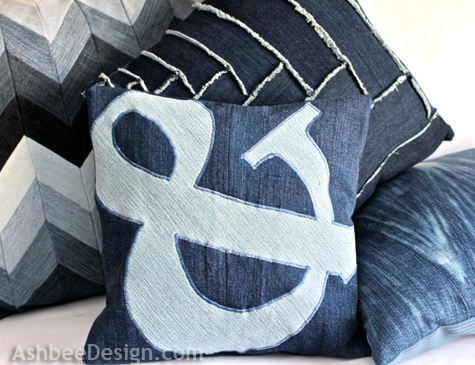 This series overview pulls together the many posts I have put together showing the possibilities of denim in craft and décor. I expect this series will grow with time. I've yet to use my collection of old jeans for a project but there are certainly great ideas in this batch of posts. A series of ideas for recycling Jeans Pockets - just the pockets! Many denim pillow ideas, some using pockets, some using quilting. 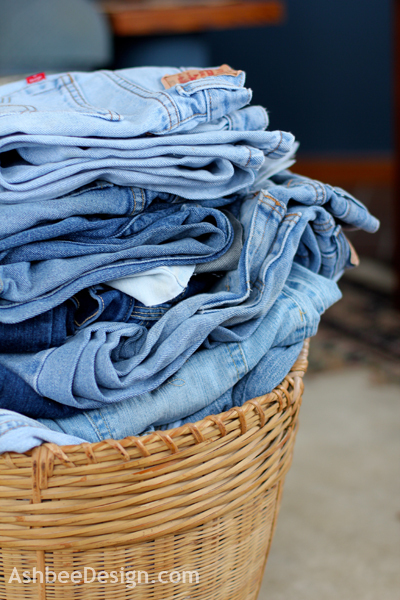 Worn jeans come in many various hues. This post shares examples of wall hangings created by artists using these gradations effectively. All types of containers from purses to bowls to baskets and more. Quilting is a natural for any scrap fabric and recycled jeans are no exception. But oh the variety! From country to contemporary and everything in between. Finish the edges or fray them. There is a softness inherent in frayed jeans. See how it is used as part of function or design. Denim is tough stuff which makes it a natural for casual furniture - and one not so casual option. And then there is everything else from jewelry to lampshades. This is gorgeous...... ! I am soooooooo impressed by your design. Great tutorial....! Thanks Crystelle. I have been working on the photography thing. Some times it works, some times not. but I keep trying! I love it! So creative!! Ooh, I love your pillow! I live in jeans as well, and just recently got rid of a stack of old ones- phooey! I got another batch at the swap shack at the local transfer station - a a let my friends know I was collecting them. You should be able to get enough the next season change as people clean out their closets. This is amazing!!! Great job. I wish I had that many pairs and colors of old jeans! Start collecting - just let everyone now you are. So many people have a stash they don't know what to do with. It looks like we have been inspired by many of the same projects. 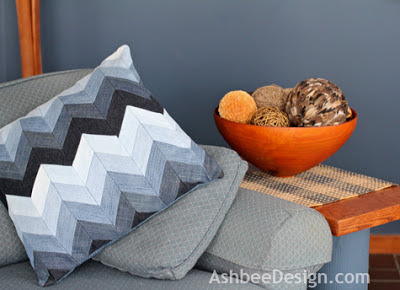 I adore the chevron pillow! I pinned that! So awesome!!! Awesome pillow and tutorial! Loving the chevron. I too have a collection of jeans and some pinterest ideas. One of these days I'll get around to that. I'd love it if you would link this up to my new linky party, "What We Accomplished Wednesday." It goes live about 6:00 PM eastern time tonight. Have a great week! Be sure to check out my links above for an incredible array of ideas for old jeans. I've been collecting them for a while now. Oh My! Such a crazy-cool pillow! I love it. I must get better at sewing. I'm so jealous of your skills! This only required very basic sewing skills - all straight seams, no curves, no darts, no zippers! Wow. That looks fantastic. I love it. I would love it if you would link this up to my link party. I love this! My aunt made me a denim pillow and I hated it but this is really cool! Stopping by from the link party and SO glad I did! I sympathize with your aunt. NOt everything I made comes out this way! I consider this one a success. It is an easy sewing project- all straight seams. Give it a try. Love this pillow. What a great use for old jeans. lovely! loved the way it came out. I can see the effort you put in. someday I will too! thanks for the inspiration. Send me a photo when you do! whoa. now THAT is pretty awesome! This pillow is gorgeous. I've never seen old blue jeans remade in a more classy way. Nice job. Thanks everyone for all the positive comments. I am working on another pillow from the old jeans now - not quite the stunner this one is but made to complement this one on the same sofa. LOVE this pillow! It is awesome. You are so talented. I am featuring this at somedaycrafts.blogspot.com. Keep this and try it as an early sewing project. 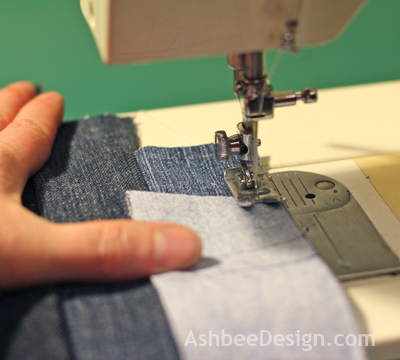 It is all straight seams.The hardest part is that sewing in denim is tougher than other fabrics. This is such a fantastic idea! I reuse as much jeans as I can in this house. It looks great! Denim is great material to work with. Not only is it a beautiful color but when used, it can be so soft. Thanks Happy! Looks like you spent some time exploring. I appreciate that. Love this pillow! I have pinned this and planI to make one of these for my sons room. Thanks for the great tutorial. Perfect for a boys room. Send photos when done. Hi Marji Roy, I started a new party called 'Saturday Sparks' and would love to have you join the partyl if you have a chance. How funny, I would think a denim pillow would be something very far from my taste, but your pillow it quite cool! I was amazed at how stylish it ended up. 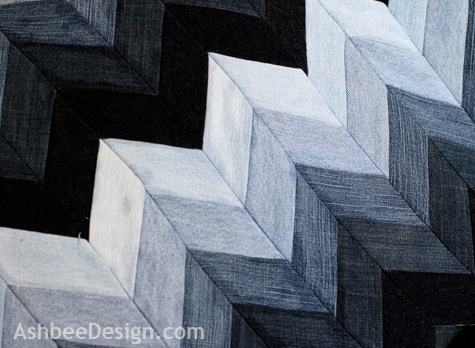 THe chevron pattern really made a very striking fabric. I really like this... I'll confess that this amount of sewing scares me a little but the end result looks great! It was amazingly simple. That is the trick of sewing stripes and then cutting them. So creative! I don't have the patience yet, but hopefully the better I get at sewing I can tackle a project like this some day. It didn't take very long to make. This technique is surprisingly easy. Send pics when you do! So cute & clever! I love how you laid out the colors perfectly! Confession time. I didn't have a good light color so I took a pair I still wear and used them! The color spacing was that important! Thanks for the feature. I'll hop over an comment and see what else you are featuring. 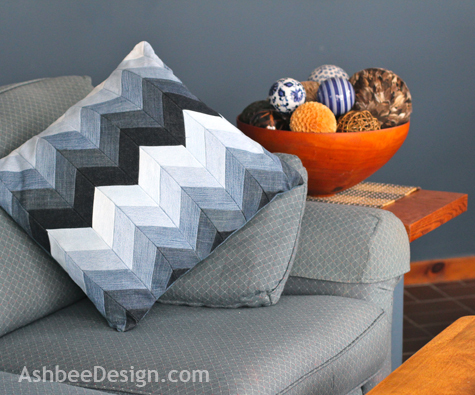 This chevron pillow looks fantastic!! Well done! Thanks for sharing this at Romance on a dime!! This is so AWESOME!! I'm featuring it tonight at MMM! Oh boy! Another feature. My numbers were starting to fade. Hopefully my faded denim pillow will make them climb again! This looks amazing! I'd love for you to check out our Pattern Party! Only those with patterns are invited to link up. Check it out! Oh WOW Im impressed with the sewing skills & design! Please share at our 1st Linky Party! 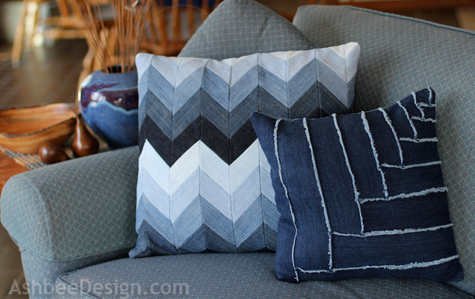 I love all of your denim pillows but the herringbone one is my favorite - I saw some similar designs at High Point Market last fall so they are definitely on trend right now! I am generally five years behind the trends! Takes me awhile to warm up to new ideas. Chevron was easy. Pallets- not so much! This is so awesome. I tried doing this with a pillow I made recently. It really requires some skill and determination. LOVE your pillow! This was the first of the denim series. I am working on design # 4 now. Enjoying the variety possible. The art looks wonderful just as your thought. I just took a swing at making this and struggled toward the end. Everything was coming along fine, but I think the four inches between the strips cut at a 45° angle are too wide. Are you sure all the demensions are correct? Has anyone else made this and struggled with the same thing? The 4" is along the 45 angle. The strips when put together end up being about 2 1/4" visible with probably the strip being 3" to allow for sewing seams. Great tutorial. thanks for the detailed instructions. The commment by Connor (July 20, 2016), and yours reply July 24 2016 are needed to make it. (Maybe consider revising original instructions so this point is not missed.) Thanks for a great blog with lots of great jeans ideas! Mine did not come out quite as well, but still happy with it. Thank you so much for the great tutorial! These chevron stripes looks really good. On the off chance that you as of now have a flexible foam sleeping pillow, you should give some genuine idea to obtaining an adaptable foam pillow also. Updating your pillow will help finish your extravagance rest understanding and help guarantee you get the most serene, agreeable rest conceivable. I find a very good website for the best best pillow for side sleeper with neck and back pain. you can visit this site. This is soo beautiful. I'm new to patchwork, and I wonder if I should zigzag the edges of the stripes. I'd like to use your design for a pillow. My first patchwork :-). I did this and it turned out great. Two things I'd add -- the instructions here have an unclear error. When you cut the strips at 45 degrees, the cut strips should be 3" wide. That's measuring 4" down the vertical side of the piece and cutting at a 45degree angle -- the strips are not 4" wide as noted in the directions. 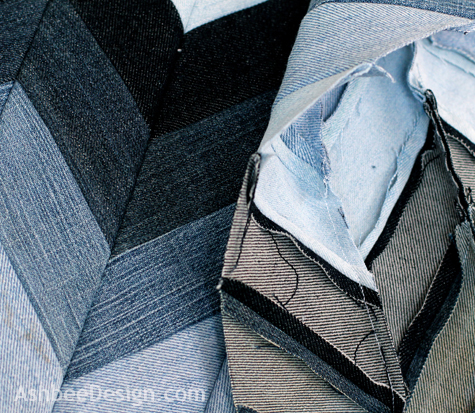 I ended up using some vintage pre-cut denim left over from a rag rug project, so some of my strips were a bit wider than 2.25" and some were smaller and I didn't always have 4 strips of the same color. I matched as close as I could but have two very dark stripes that do match all the way across. Exactly matching the dark stripes draws the eye to them and away from bits that don't match as well. The whole thing still looks great.